Buyer guide: CamCor CT and Rheonik RHE08 Hey, all! We’re back to Coriolis flow meters with an interesting duo of devices. Hey, all! We’re back to Coriolis flow meters with an interesting duo of devices. Let’s welcome Cameron’s CamCor CT series and Rheonik’s RHE08. We’ll see what they offer and draw some conclusions based on that. Cameron enters the big leagues with its CamCor CT series. You may not know this product or even this brand, but you probably will hear more as it grows. So check out what the CamCor has on tap! This device flashes a little bling with good design and display features. It comes with a U sensor – good for pressure, bad for space. So you have to decide which you need more. The display comes at a size of 128 by 168 pixels with a backlight option of either white or orange. It shows your process data, diagnostics, and other parameters at a comfortable size. It also comes with an infrared light sensor which lets you set up without removing the housing. Impressed yet? On the downside, it doesn’t offer loop power. As for integration, it has analog+HART plus an RTU Modbus. You also get pulse and status input and output, if you like those kinda things. The CamCor can measure temperature, mass flow, volume flow, and density – nothing new but always good to have. The CT series has sensors with nominal connections from ¼ inch to 10 inches and plenty of wetted materials – 316L stainless steel, C22 alloy, and more! It comes in a stainless steel housing too. This device has an accuracy in liquid of +-0.1 percent, in gas +-0.5 percent, and a density of +-0.0005 grams per milliliter. For process temperature, you can get the standard option from -20 to 90 degrees Celsius, a high option from -20 C to 350 C, and a low from – 40 C to 55 C.
Lastly, the transmitter can withstand -40 to 55 degrees Celsius and has a rating of IP66 and IP67, making it water resistant and dust-proof. The CamCor looks like a simple option compared to other devices in the market, but it has a few features to increase its appeal. Firstly, it comes with a plethora of approvals. Secondly, you can check its diagnostics on the display or remotely. Thirdly, the self-diagnostic can verify anything on the device, from the probe to the drive coil. Fourthly, the pipeline vibration check alerts you to external interference that can affect your measurements at zero flow. Finally, the pipeline oscillation check can do the same but with flow running through the meter. And now we come to the Rheonik RHE08. Rheonik doesn’t have a huge footprint on the market, but this company has had that foot there for a while. Anyway, enough talk! Let’s see how Rheonik can support new applications. The RHE08 has a bit of a chunky design, sporting 332 by 218 by 146 millimeters and nearly 5 kilograms. And it only comes with a wall mount, which works out great if you happen to have a wall nearby. The simple LCD display gives you 16 characters and 2 lines for your basic data and buttons for your local configuration. Sadly, it only offers HART over analog, RS485, RS422, and RS232 for integration – no digital here. As for the output, it comes with two analog, one frequency/pulse, and three digital status. Hope that works for you! Yes, this too measures mass flow, volume flow, density, and temperature. Furthermore, using the density data, you can calculate the concentration as well. And this too has the U-shaped sensor. At an accuracy of 0.15 percent in flow measurement and 0.5 percent in density, the device offers modest performance. 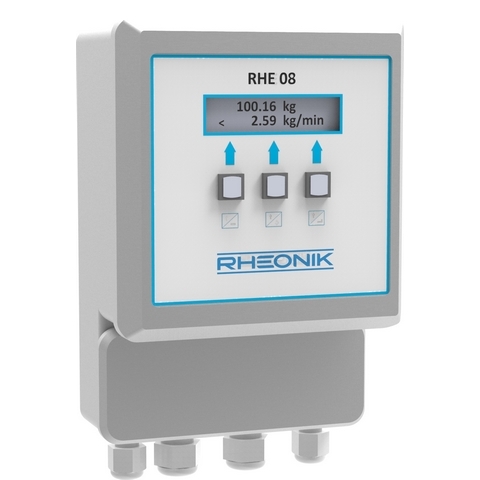 The Rheonik RHE08 can handle -196 to 350 degrees Celsius and 392 bars. Also, it provides a strong selection of wetted materials. Best of all, if you don’t see one that suits you, then you can ask for more! No guarantees you’ll get the moon, though. No loop power here either, but it has input options such as 24 volts of direct current or 110/220 volts alternating. The housing has a rating of IP65 and ATEX/CSA approvals for hazardous areas. The Cameron CamCor CT has a few better points, but the Rheonik RHE08 offers better range and more protocols. So, which one does it for you? If you don’t care for either, then feel free to check out our device page for other similar options.